As a serious developmental disorder, the severity and range of autism symptoms affecting individual children may vary. In almost all autism cases, however, the ability to interact and communicate normally are both severely hindered. Between three and six American children out of every 1,000 are diagnosed with autism and, while it is widely believed that a cure for this disorder does not exist, many are finding natural treatments with a focus on holistic health to be very effective. Research also indicates that early detection of autism symptoms, its diagnosis and treatment make a significant difference in the quality of a child’s life. Autism symptoms are the result of a brain disorder, which causes impaired communication and, to varying degrees, a lack of interest in social interactions. Parents, doctors and researchers are not able to yet pinpoint distinct autism causes for every case. Increasingly, however, there is concern about the relationship between the diagnosis of autism cases and preexisting gastrointestinal problems, such as vomiting, diarrhea and constipation. Controversial speculation also exists, which suggests that the onset of autism symptoms may be triggered by childhood vaccinations, though doctors and mainstream researchers insist that there is no conclusive link between autism and vaccinations. 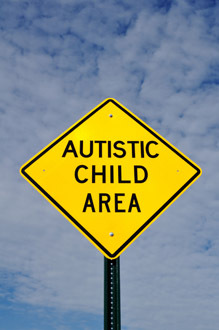 Autism signs are typically first displayed in early childhood. In rare autism cases, seizures and other symptoms described below may persist. It is after observing striking, abnormal and sometimes sudden behavioral and neurological changes in a child, that a parent is prompted to take a child to a doctor where a full examination is rendered and a diagnosis is given. It is important to note that each child diagnosed with this disorder may exhibit different autism symptoms, which can make finding a treatment plan even more difficult. However, with early diagnosis, patience and an intense commitment to identifying suitable autism treatment methods, many have found a measure of success in easing autism symptoms. As doctors and parents struggle to find an exact cause of autism symptoms, many believe that removing gluten and casein found in dairy products from a child’s diet hold incredible promise for its treatment. Noted author and autism advocate, Donna Williams also has autism. She maintains that, along with nutritional supplements, a dairy-free, gluten-free, low salicylate diet (salicylates are found in certain foods, such as apples, cherries and other foods) has significantly reduced her own autism symptoms. Actress and autism advocate, Jenny McCarthy, agrees with this remedy and has used it on her own son, Evan, whom she claims is recovering from autism with the help of a restrictive autism diet. Products, which do not contain milk, but do contain caseinate are also advised against on the autism diet. Holistic health strategies, which focus on healthy living through proper diet, exercise, spiritual and mental nurturing are always recommended. This means that, in addition to an autism diet, processed foods, fast foods, and foods containing chemical additives, white sugar and white flour should also always be avoided. Along with proper exercise, daily rest and loving family activities, such avoidances support a child’s immunity against illnesses and disorders, including autism. Although diet is assumed to be a contributing factor to this disorder, parents should be advised that it is but one of many autism treatments. Others that may be recommended by a medical professional should also be given worthy consideration. Also, a nutritionist or other professional should be consulted before changing a child’s diet in order to assure that the child is getting all of the vitamins, minerals and other nutrients needed for healthy growth and development.